Officially a British Overseas Territory, the Cayman Islands are an island nation and country in the Caribbean. Made up of three islands in a chain, the nation has a relatively short history in comparison to its Central American neighbours – with settlement first recorded during the era of the Atlantic Slave Trade. Home to less than 60,000 people, the beautiful Cayman Islands have become an increasing popular destination for wealthy investors in recent years due to it's favourable tax laws. Gaining notoriety and fame as one of the few tax-exempt nations in the world, the Cayman Islands have become a wealthy tourist destination favoured by residents of the United States and Europe. The nation has developed a reputation as somewhat of a celebrity playground, with a number of rich and wealthy westerners purchasing property for sale in the Cayman Islands as second homes or for extended stays in the nation. The Cayman Islands are made up of three islands, the largest and capital of the trio being Grand Cayman. 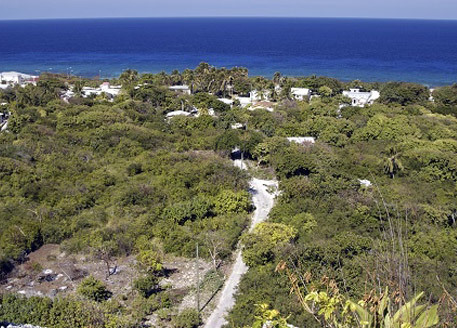 Little Cayman and Cayman Brac are much smaller and found clustered together some 100km east of the main island. The nation resides in the northern centre of the Caribbean sea, south of Cuba and west of Jamaica – 600km north-east of Honduras and the South American mainland. George Town is the capital and largest city of the Cayman Islands, found on the western tip of Grand Cayman. Each of the three islands has its own airport, with the largest being on Grand Cayman and near the capital city – Owen Roberts International Airport caters for more than a million passengers annually. Collectively the Cayman Islands are home to less than 60,000 people – a number dwarfed by the amount of businesses registered throughout the nation. The unique tax exemption makes the country one of the most popular banking and business countries in the world. Of the 55,000 strong population, less than 3,000 people live on the smaller of the two islands and almost half live in the capital of George Town. Properties for sale in the Cayman Islands are always popular with foriegners, with more than 100 nationalities being represented throughout the small population - and only half of the total residents native Caymans. The main ethnic groups include 40% Afro-European, 20% European and 20% African. The Cayman Islands are most famous for their tax laws, with exemptions making them a heaven for banks and businesses. Popular rumours cite that King George III enacted these laws in return for the Caymans saving his son from a shipwreck – though historically the nation has never levied any income, capital gains or wealth taxes. Whilst the urban legend lends the nation romanticism – though it has come under much criticism for giving western companies the ability to avoid paying tax. As a result of this increased international activity and high wealth, the islands have exploded into a successful tourist industry and are attracting thousands of people every year to the idyllic coastal resorts. For more information or if you are interested in purchasing property for sale in the Cayman Islands, get in touch with the Hopwood House team today.